While the boy had bats, the girl opted for witches. We love Halloween, so we're milking the Halloween lunches every chance we get! 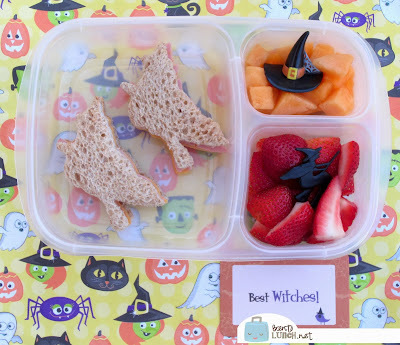 Faith had a very similar lunch to Ben's in terms of food--two ham and cheese sandwiches on whole wheat, but cut into witch shapes, cantaloupe accented with a witch hat, and strawberries with a witch pick. Even her Lunchbox Love card had a witch motif. Besides the lunch, she also took yogurt, applesauce and a granola bar for snacks. Lunch is packed in our Easy Lunchboxes. I also used the orange lid in keeping with the season. Loved going thru ur bentos ! !.